Eight division former world champion Manny Pacquiao came roaring back on Saturday night, ending seven months of retirement to outfight welterweight foe Jessie Vargas at the Thomas & Mack Center in Las Vegas. 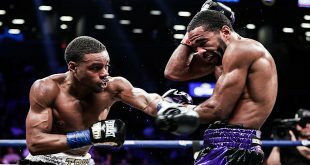 The 37 year old "Pac Man" overcame a very committed Vargas, who won the WBO belt this past March, trading hard shots with the taller and much younger Las Vegas native in the early rounds. Pacquiao turned back the clock at times, mounting a freewheeling southpaw offense that put Vargas on the canvas in round two, but could not gain the upper hand during the first half of the contest as the champion startled the crowd by landing big shots on the Filipino legend. The challenger got his second wind in the later rounds, timing his tiring opponent with hurtful punches from both hands. Vargas showed great heart in refusing to buckle under the punishment but was showing great signs of wear and tear by the fight's end. Pacquiao swept all three scorecards, which read a too wide 118-109 (twice) and a too close 114-113, to regain the WBO welter strap that he had lost last year to Floyd Mayweather Jr. The feat was made all the more remarkable as Pacquiao, now 59-6-2 (38), had to fit his fight preparation in between his full-time work as a Senator in the Filipino government. Vargas suffers his second loss in his last three outings and falls to 27-2 (10). The lanky 27 year old will probably see a career boost given his gutsy performance against modern day great Pacquiao. 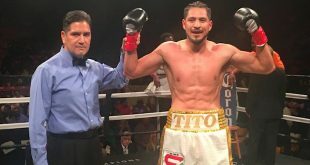 The undercard was rife with WBO title action, with contests for that organization's top honors in the super bantam, featherweight and flyweight divisions. Three-weight world champion Nonito Donaire, 37-4 (24), lost his WBO super bantam belt after tangling with undefeated southpaw Jessie Magdaleno, 24-0 (14), as the 33 year old Filipino was not as lucky as his countryman Pacquiao in staving off a much younger opponent. The 24 year old Magdaleno started strong out of the gate, pinning back the older champion until Donaire got a good read on the local man and began to land his quick-handed bombs. But Magdaleno showed durability in taking the punishment before turning the tables on Donaire. Donaire regrouped to force a thrilling firefight down the stretch but the judges favored the challenger by margins of a seemingly wide 118-110 and two servings of 116-112. Magdaleno captured the WBO super bantam belt during his first world title opportunity while Donaire saw a four bout win streak snapped but is still very much in the mix at 118 pounds. WBO featherweight boss Oscar Valdez, 21-0 (19), was successful in his maiden title defense, battering hard as nails challenger Hiroshige Osawa, 30-4-4 (19), until the contest was halted in the seventh frame. The Japanese visitor had not lost a fight since 2009 but the WBO Asia Pacific titlist was stepping up to world level for the first time and the gulf of experience between Osawa and Valdez was evident throughout the bout. Mexico's Valdez was in peak form, producing a slashing offense that kept Osawa on the defensive for the entire fight. The over-matched tourist was canvased in the fourth but soldiered on, walking through a hail of punishment before a referee stoppage put an end to the proceedings in the seventh. Also on the bill, Chinese star Shiming Zou, 9-1 (2), made sure his second world title shot was a good one by drubbing Thailand's Prasitsak Phaprom, 39-2-2 (24), over 12 rounds to win the vacant WBO flyweight strap. 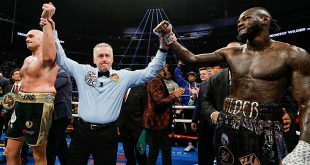 Zou was all over Phaprom, decking the Thai in the second before blanking his rival by margins of 120-107 (twice) and 119-108 on the scorecards. The pair had tangled previously in 2014, with Zou winning a unanimous decision. Both Phaprom's professional losses have been to Zou.